Every so often there is an absolute run on a pattern and yarn. It happened with Amanda’s Jenny wrap and with the Clapotis and Handmaiden Mini Maiden. It seemed that not only were knitters enamored with a certain pattern, they just HAD to have the exact same yarn to go with it! Well the latest craze? Insouciant by Julie Hoover. 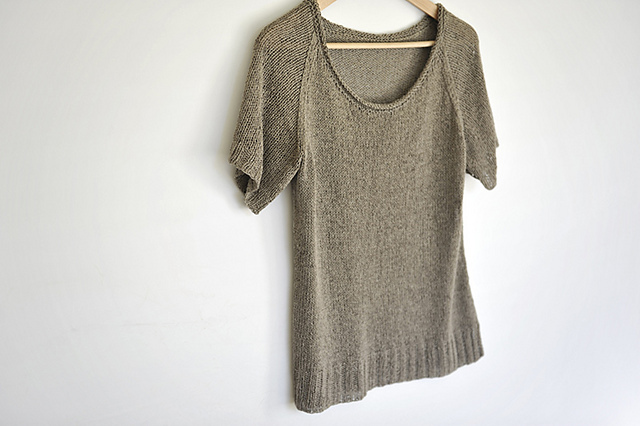 This pattern is a simple and elegant t-shirt with the lovely drape of Habu’s Tsumugi Silk. The shape of the shirt is such that it would fit any body type and the yarn is a beautiful tweedy raw silk. Nothing wrong with that combination! Anina is working on hers and more than a few have come through the shop in the last few weeks. 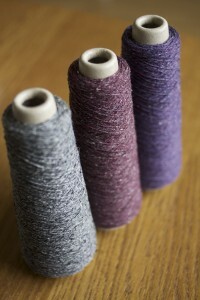 Here at UY is seems that what we really do is substitute yarns. There are always endless combinations that would work for any given pattern. Insouciant seems to be an exception to this rule. There is really no other yarn that is quite like the Habu Tsumugi and I can’t even think of another yarn I would use! It’s just a perfect combination. This entry was posted on Monday, June 25th, 2012 at 5:49 pm	and is filed under Kim Werker, Uncategorized. You can follow any responses to this entry through the RSS 2.0 feed. Both comments and pings are currently closed.